Sleeves are a great aid for rearing Lepidoptera. Sizes are approximate. On growing foodplant sleeves enable a constant source of fresh food, and for periods away on holiday larvae can be left unattended for days. 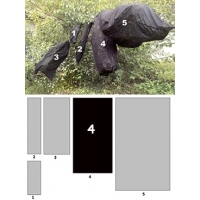 The sleeve can be on a bush or tree outside, or it can be slipped over a potted plant. As well as providing fresh food, the larvae are prevented from wandering, and they are protected from predators and parasites. Sleeves can be a useful substitute for cages, and much less costly. You can often rear larvae on cut food contained in a sleeve, as long as the foodplant is changed before it loses its freshness. The sleeve is slipped over a branch or plant and both ends are secured to prevent escape. Our sleeves are hand sewn using black material which gives excellent visibility. The mesh is fine. 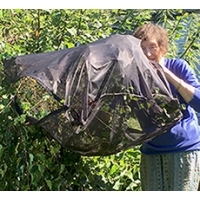 The netting is strong and durable – suitable for use throughout a winter for hibernating larvae. Click the View button to see tips on using sleeves and diagram of sizes. NEW Zipped Bag Sleeve with side opening for instant access. This size is ideal for rearing small larvae enclosed and under close control. The end of the bag is sewn up. The open end is slipped over a branch and tied. 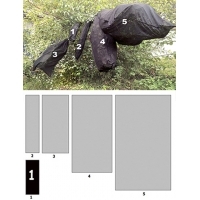 The side zip gives wide access for inspection, photography or removal of frass and any dead leaves. When you use a Zipped Bag Sleeve you will wonder why it has taken until now to use such an innovation! This long, slender sleeve is for young larvae on long branches of trees like Willow. The end of the bag is sewn up. The open end is slipped over a branch and tied. 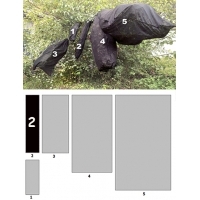 The side zip gives wide access for inspection, photography or removal of frass and any dead leaves. Also ideal when you find that a caterpillar has hitched a lift on your arm! This size gives considerable extra space for larger larvae, or increased numbers. The end of the bag is sewn up. The open end is slipped over a branch and tied with string, or better still, the Velcro ties that we recommend in this Sleeve section. Access from the side zip is not only instant for opening and closing, but you can really get to any part of the sleeved branch. The way is clear for all inspection and maintenance, and frass is instantly removed. You can easily collect semis (fully-developed larvae that are preparing for pupation) ready to go into their puparium. If the larvae are cocoon spinners you can reach all areas when you wish to collect the cocoons. The zip means that you can easily pop a caterpillar back if you find one has crawled on to you while attending to the sleeve. If showing the larvae to family and friends, it's so much better to unzip the side than undo an end, and have to gather and tie it again - simply open the sleeve, with wide access, then instantly zip it up again! Giant Size 5 100 x 160 cm NEW Bag Sleeve with TWO zip openings on opposite sides, for instant access. The end of the bag is sewn up. The open end is slipped over a branch and tied. This is truly a GIANT size! You can sleeve an entire bush, or large branch. Ideal for serious breeders, wanting to give very natural conditions for the larvae being reared. It's so big that zips are provided on two sides, so you can get to any part of the sleeve. SO much easier than tunneling in from one end! This giant size makes a very economical giant cage. With two wide zips the way is clear for all inspection and maintenance, and frass is instantly removed. When large larvae are ready to pupate, Hawkmoths and others change their colour and shape, becoming shorter and fatter in readiness for pupation. With the zip access these semis are easily collected each day, to go into their puparium. Conventional sleeves, open at either end and with no side access, take much longer to open and close, particularly so when using very large sizes. It is quite common to find, after struggling to gather and tie the free end, there are one or more caterpillars you want to put back inside. With zip access there is no struggle - just unzip, pop in the late comers, and zip up again - INSTANTLY! Showing the larvae to family and friends is so much more interesting, when you can open the wide zip, display the larvae in their natural setting, then zip up again, with no faffing! When you use a Zipped Bag Sleeve you will wonder why it has taken until now to come up with such an innovation! A NEW and much easier method - quicker and more secure than using string. 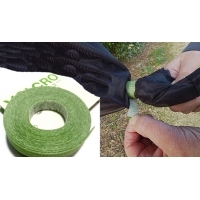 A 5 metre roll of Velcro band will last for years, and the strips can be used over and over again.